The weekend was, for John Dean II, was a tale of two different races. 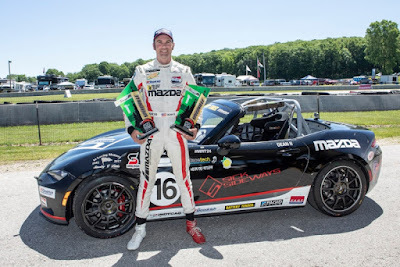 Dean had an excellent qualifications session setting him up, due to having the two fastest laps against the times of all other drivers, to secure the pole position for both races held at Road America. One featured classic positioning and car placement allowing the cars behind his No. 16 Black Sick Sideways prepared Battery Tender Global Mazda MX-5 Cup Miata to rub and scrub each other while not being able to get enough kinetic energy in the draft to complete a pass. The other had all of the drivers focused on one thing in passing the leader with some success yet never actually putting the No. 16 away. Dean earned a flag-to-flag victory in Friday’s Round Five race, but the MX-5 Cup competition wasn’t about to let him do the same thing in Saturday’s Round Six. Though he started from pole in the No. 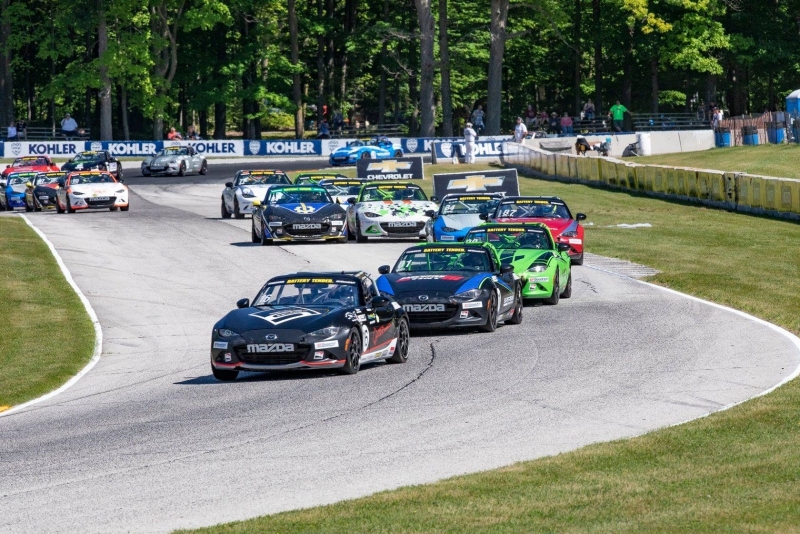 16 Sick Sideways Global Mazda MX-5 Cup entry and held his lead in the opening laps, it wasn’t long until he fell victim to the massive drafting potential presented by Road America’s 4.014 miles. Global Mazda MX-5 Cup continued to demonstrate incredible competition, with 305 passes for position in the 40-minute race, including six official lead changes. The top 10 were nose-to-tail all race long and nobody was able to break away from the pack, Dean included. That smile came with eight minutes left in the race, when a full-course caution was issued for a car stuck in the gravel at Turn 14. Dean found himself in the lead behind the safety car, with teammate Nathaniel Sparks behind him. When the green flag came back out, the white flag was waved with it to single one lap to go. The Sick Sideways teammates worked together to hold off the rest of the field and crossed the finish line with Dean out front and Sparks in second. It was an impressive comeback for Sparks in the No. 8 Sick Sideways car, who started second, but tumbled down the order in the opening lap. He spent nearly every lap thereafter door-to-door with another car, clawing his way back to second. Finishing a hard-fought third was Robert Stout in the No. 28 McCumbee McAleer Racing machine. His teammate, Joey Bickers, led briefly in the No. 34 McCumbee McAleer car, but just missed the podium, finishing fourth. Improving a remarkable 10 positions in the race, Keith Jensen earned the Battery Tender Hard Charger of the Race award. 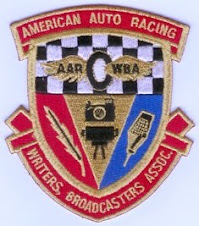 He finished 13th after starting 23rd and collected $1,000 and a Battery Tender charger for both himself and his crew chief. Robert Noaker, the youngest driver in the series at 14 years-old, was the highest finishing rookie. His No. 13 Sick Sideways crossed the line in 10th, earning him valuable points toward the $75,000 prize for Rookie of the Year. He trails Selin Rollan in that contest, but Rollan exited Round Six early. 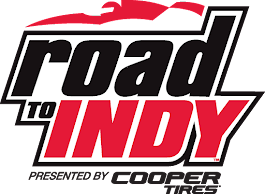 Nikko Reger, who finished runner-up in Friday’s race continues to lead the Championship points ahead of Bryan Ortiz. 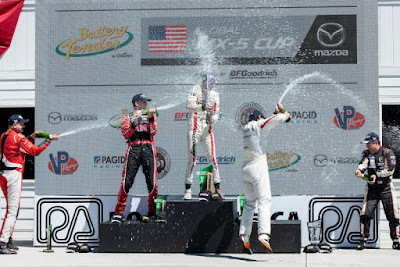 Dean moves up to third with his Road America sweep. For the last year, Mr. Dean, as owner of the “Mazda prep shop” and MX-5 Cup race team, took to the track for only two races, taking the year off from full series competition to concentrate on the expansion of Sick Sideways into a new location near the Sebring International Raceway. 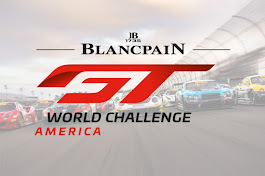 Really a bit of the theme here - John Dean II (as in two), top two qualification lap speeds securing two pole positions, 2 races, 2 wins, with the last race having Sick Sideways race car at the top two positions on the podium. What breaks this thread up is that Dean entered the weekend at P9 in the points and leaves Road America at P3 in the points - no 2's here. 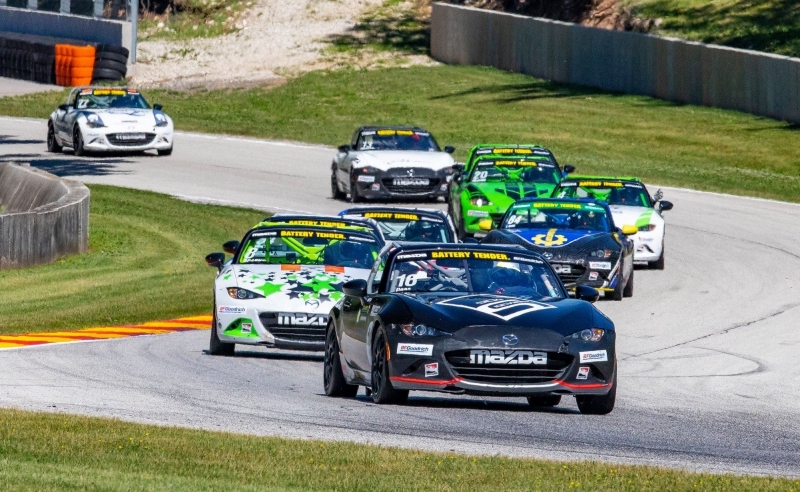 With this surge, Maybe John Dean II will secure his second (as in two) Battery Tender Global Mazda MX-5 Cup Series Championship. 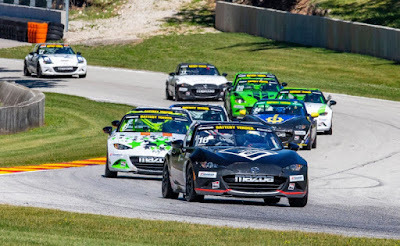 Replays of this weekend’s doubleheader at Road America can be found at the Mazda USA YouTube page. 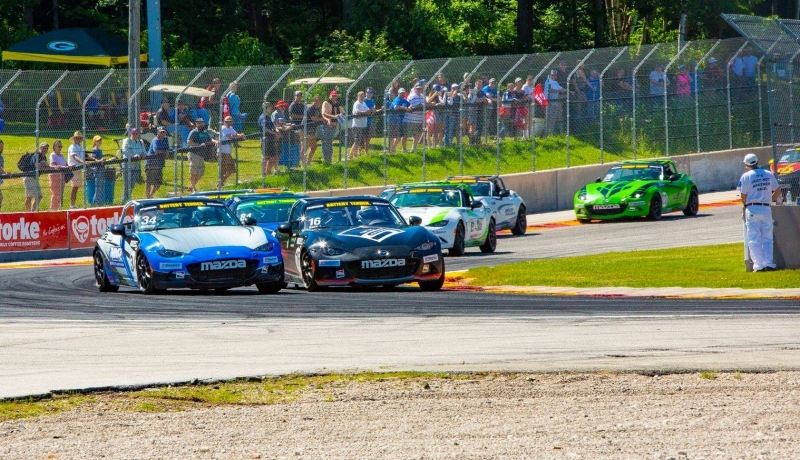 Next on the schedule for the Battery Tender Global Mazda MX-5 Cup is Mid-Ohio Sports Car Course, July 27 – 29.